Your support helps to "Keep the Republic!" Thank you for your interest in making a tax deductible gift in support of the educational work of the American Village Citizenship Trust. 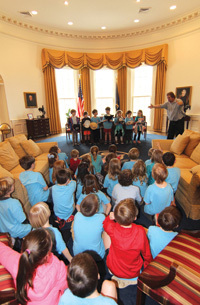 The American Village is a nationally-pioneering classroom and American History and civics education center that engages and inspires 35,000-40,000 students annually from Alabama and Southeastern states in experience-based academic programs related to American history, civics, and government. Your gift will help us to strengthen our educational programs and continue to make them even more engaging and powerful by enhancing the teaching of the vital lessons of liberty to our youth as we embark on the journey to expand the number of students served on-campus to 100,000 each year, drawing school and youth groups from throughout the Nation. Citizens, leaders, and stewards: all are called to keep the Republic. Thank you for answering the call and supporting this important work! Once you have made a gift we will provide you a letter/receipt for your tax records. The American Village Citizenship Trust is recognized by the IRS as a 501(c)(3) tax-exempt organization. Gifts to the American Village Citizenship Trust are fully tax deductible, less the value of benefits received, in accordance with the Internal Revenue laws of the United States. In all tax matters you should consult a qualified tax advisor. Your name as you would like it to appear in recognition of your donation: If left blank, we will use the name listed in your billing information to recognize your donation. Honoree Name: Required Honoree name is required. Notification Recipient Name: Required Notification recipient name is required. Enter the name of the person that should be contacted regarding this gift. Notification Recipient Street 1: Required Notification recipient street is required. Notification Recipient City: Required Notification recipient city is required. Notification Recipient ZIP/Postal Code: Required Notification recipient zip or postal code is required. Message Body: Required Message body is required. This message will be sent to the notification recipient. Message Signature: Required Message signature is required. First Name: Required A first name is required. Last Name: Required A last name is required. Street 1: Required A street address is required. City: Required A city is required. ZIP/Postal Code: Required A zip or postal code is required. Email Address: Required An email address is required. Yes, I would like to receive communications from American Village Citizenship Trust. Credit Card Number: Required Credit card number is required. CVV Number: Required CVV number is required. What is this? Bank Routing Number: Required Bank routing number is required. What is this? Bank Account Number: Required Bank account number is required. Verify Bank Account Number: Required Bank account number is required. please call (205) 665-3535, ext. 1021 (Jennie Gregory). at (205) 665-3535, ext. 1072.